You can add discount rules with conditions using Prestashop´s API, avoid mistakes and sabe work. From now you will no longer add discount rules with conditions at Prestashop´s Backoffice. The Addon ofers you the chance to add discount rules (of catalog and cart) trhoug Prestashop´s Webservices using all the options avaliable at Backoffice, as add a rule to a category, mark, product, etc. You can send catalog or cart rules with conditions. Extends the funtionality of Prestashop´s API to be able to send both catalog rules and cart rules with their respective conditions using the API. Option to delete obsolete files automatically. 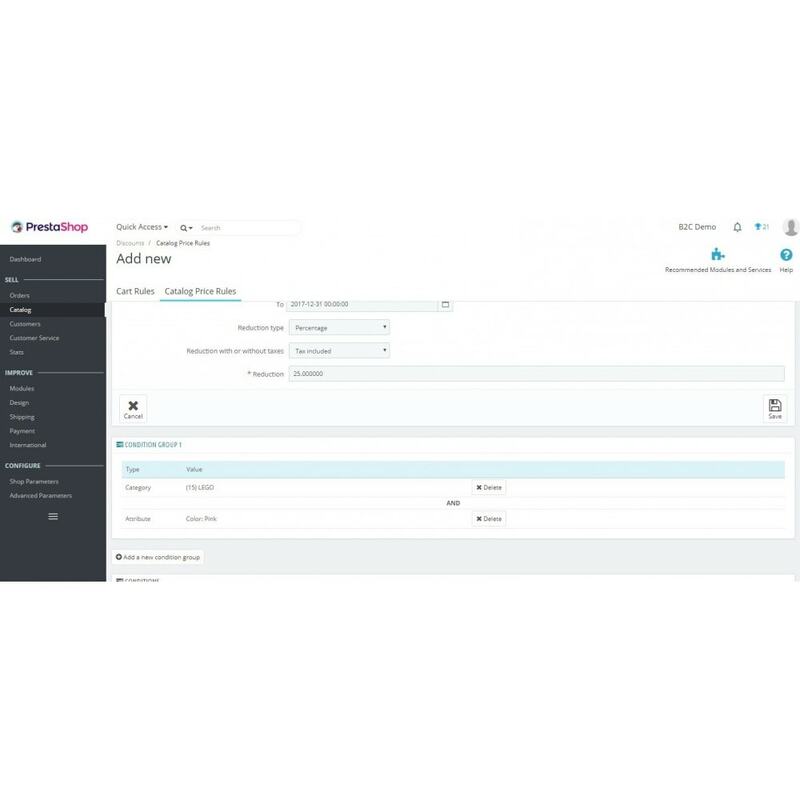 It add an option that can be activated or disactivated from the BackOffice, which allows that when a cart rule is uploaded, all existing rules which affect the product or products affected by the new one are deleted. Option to automatically delete obsolet rules. It adds an option that can be activated or disactivated from the BackOffice which allows that when a cart rule is uploaded, all existing rules affected the product or products are deleted. Option to use the specific Price as base Price It includes an option that can be activated or disactivated from BackOffice, which allows us that the fixed Price entered in the “Price” section of a product could be used in the “Specific prices” section. If you need that we do some customization at the addon, please contact us to request a quote. Do you have any question? Send us a message and we respond you as soon as possible. It allows you to delete the rules which affect the same produc or products that you are triying to send. You can add several restrictions at the same time. 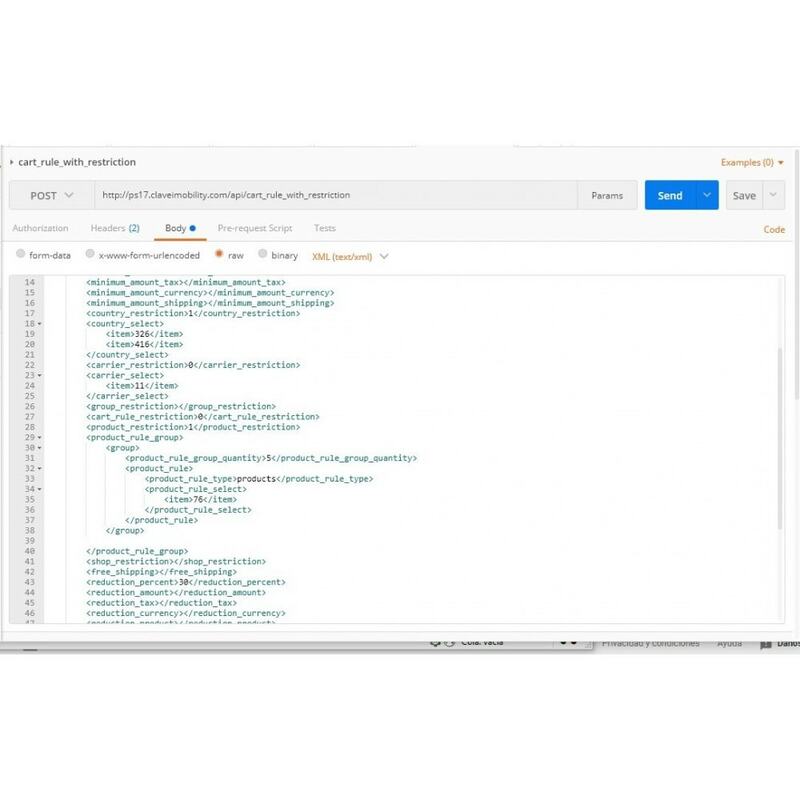 Include the code needed to run Google Tag Manager in your shop and be able to carry out several functions such as manage Google Analytics and track the conversions in AdWords. Add a button to your store that allows your customers to contact you through WhatsApp. In addition, from the BackOffice we have the possibility to open a conversation via App WhatsApp with our client.